In the United States, real gross private domestic investment currently represents 14.1% of real GDP, or $1.9 trillion. But it only represented 12.6% in 1993, after the Clinton tax hikes. Then in 1997, the Republican-led Congress passed a tax-relief and deficit-reduction bill that was at first resisted but ultimately signed by President Clinton. The 1997 bill lowered the top capital gains tax rate from 28% to 20%. 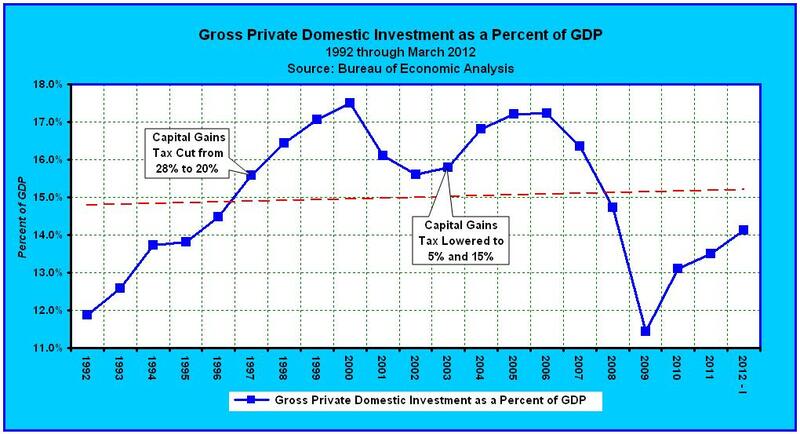 The reduction in capital gains rates encouraged greater private domestic investment, leading to GDP growth, and increases in both economic activity and tax collections. After the bill passed, real gross private domestic investment grew to 15.6% in 1997, and reached a peak of 17.5% by the year 2000. It was actually the 1997 tax cuts, not the 1993 Clinton tax hike, which produced the boom of the 1990’s. But then the Dot Com Recession began, lasting from March through November 2001, wiping out capital and reducing gross private domestic investment to a low of 15.6% of GDP. Then Republicans passed the Jobs and Growth Tax Relief Reconciliation Act of 2003. The 2003 Act slashed capital gains rates to 5% and 15%, which boosted gross private domestic investment back to 17.2% of GDP in 2005 and 2006. But then the housing bubble burst and the Great Recession began, lasting from December 2007 through June 2009, eviscerating trillions of dollars in capital. Recessions typically destroy capital, and the Great Recession was no exception. Afraid of losing again, investors have been reluctant to place new capital at risk. Government spending has since spiraled out of control, absorbing capital from the private sector with the lure of low return guaranteed government securities. Boosting gross private domestic investment back to 2000, 2005 and 2006 levels, or to between 17.2% and 17.5%, would add as much as 3.4% to GDP growth. But Barack Obama, through a series of temporary measures, coupled with threats of higher taxes, has done little to allay investors fears. So the question today is what can the U.S. government do to encourage more private investment in the domestic economy? Following are three simple policies which can and should be implemented right away. Long-term capital gains are currently taxed at a top rate of 15%, while short-term gains are taxed as ordinary income (at rates ranging from 10% to 35%). At the same time, capital losses are limited to the lesser of $3,000 per year, or up to the amount of concurrent capital gains. Interest income and ordinary dividends are currently taxed as ordinary income, while qualified dividends (paid on stocks held for 60 days or longer) are treated as long-term capital gains and taxed at a maximum rate of 15%. But this is all subject to change next year – with the rate on long-term capital gains increasing to a maximum of 20%, and the tax on interest, ordinary dividends and qualified dividends all increasing to ordinary rates of between 15% and 39.6%. Until Congress either changes or extends the current rates, uncertainty and flagging private domestic investment will prevail. But a more exigent question is whether taxing any form of return on capital investment is fair. What’s a fair tax for the return on investment? As discussed in Part I, in India, capital gains are computed differently than in the U.S. Under India’s tax law an investor is allowed to increase the cost of the original investment by the annual inflation index, before computing a capital gain or loss. Capital gains in Israel are also inflation adjusted. And as stated previously, the following countries don’t tax capital gains at all: Belize, Barbados, Bulgaria, Cayman Islands, Ecuador, Egypt, Hong Kong, Islamic Republic of Iran, Isle of Man, Jamaica, Kenya, Malaysia, Netherlands, Singapore, Sri Lanka, Switzerland, and Turkey. Other countries like Canada, Portugal, Australia, and South Africa do levy a tax on capital gains, but the tax only applies to 50% of the gain. However, in the United States, capital gains are figured without the benefit of an inflation adjustment. What’s wrong with this? What’s wrong is that the U.S. dollar has lost 96% of its value since the Federal Reserve was established and the Tax Code imposed in 1913. Therefore, much of what is thought of as a capital gain in the U.S. isn’t a gain at all, it is rather the recovery of an amount equivalent to (or in some cases less than) the purchasing power of the original investment. For example, if you had invested $100,000 in 1981, your investment would have the same purchasing power as $261,497 today. That’s because annual inflation has averaged 3.15% in the U.S. over the last 31 years (calculate it here). So an investment of $100,000, 31 years ago, which happened to appreciate by $161,497, hasn’t really made a dime. Yet the federal government will levy a tax of $24,225 (@ 15%) on the investor as a reward for believing in America. But had the same investment been made in India, Israel, or in any of the other 17 above mentioned countries which don’t tax capital gains, the return on capital would have been tax-free. So what’s a fair share? Does the USA’s current capital gains policy encourage American citizens and corporations to invest more at home, or to move abroad? The answer should be clear. But making matters worse, the tax rate on capital gains is scheduled to increase from 15% to 20% in 2013. And even worse, Barack Obama is proposing to raise the rate to at least 30% on the “wealthy”, while doing nothing for the other 98% of Americans. But on a brighter note, Mitt Romney would eliminate the capital gains tax entirely on taxpayers with incomes below $200,000, while lowering ordinary income tax rates to between 8% and 28%. Romney is on the right track, but he could go a bit farther. Why not simply index capital gains to inflation, tax real capital gains at ordinary tax rates, and allow an unlimited amount of real capital losses to be claimed within the year recognized? That way it’s not necessary to play the class warfare game. Making capital gains taxes fairer for everyone is a way to increase private domestic investment and GDP, while at the same time attracting capital back to the U.S. and away from what are currently more just investment havens. In the U.S., interest income earned on deposits at banks and credit unions, on money market funds, on bonds, and on loans, such as seller-financed mortgages is taxed as ordinary income, subject to ordinary income tax rates. Interest on U.S. Treasury bonds and savings bonds is taxable for federal purposes, but tax-free at the state level. Interest on municipal bonds is tax-free at the federal level and tax-free at the state level if invested within one’s state of residence. Interest on municipal private activity bonds is tax-free for the regular tax, but is taxable for the alternative minimum tax. Focusing on taxable interest, when the interest rate earned is less than the inflation rate, why is it considered taxable? If an investor isn’t earning at least the inflation rate, there are no real earnings, since the investor suffers a loss in purchasing power. For example, according to FDIC.gov, the national average interest rate paid on bank savings accounts is currently 0.09%, and the average rate on 60-month certificates of deposit, whether over or under $100,000, is 1.06%. Meanwhile, inflation has averaged 1.81% over the last five years (lower than normal due to the recession). So at today’s interest rates, an investor with $100,000 in a savings account is losing something on the order of 1.71% in purchasing power each year. This adds up over time. At current averages it would amount to loss in capital of 8.55% over five years. And that doesn’t include service charges some banks impose for the privilege of having an account. Interest rates banks pay today aren’t a reward, but rather a punishment. But as if interest rates aren’t pathetic enough, after losing purchasing power while trying to save a dollar or two, the federal government then levies a tax on the decline in value, ensuring that no American will ever get ahead. The return on U.S. Treasury securities isn’t any better. On July 16th, the U.S. Treasury was somehow able to sell 3-year Treasury Notes offering an interest rate of 0.25%, and a yield of 0.366%. That’s laughable especially considering that the interest earned is taxable as ordinary income. 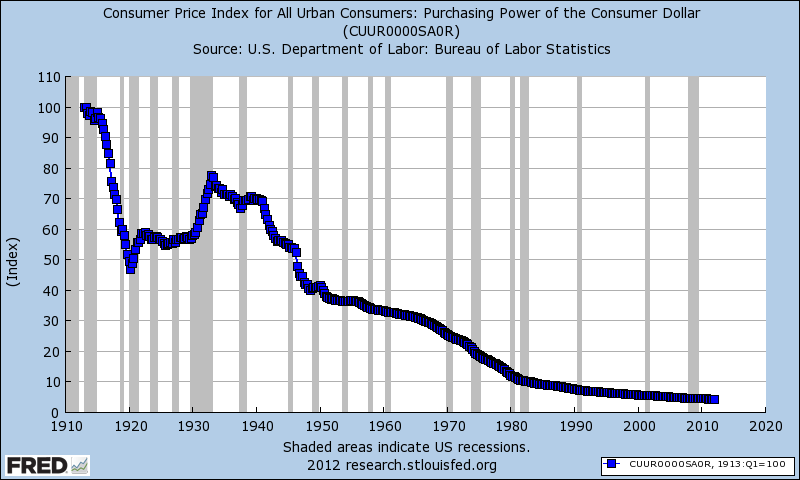 Meanwhile, the inflation rate for urban consumers was 2.93% last year, and is expected to reach 3.00% in 2013. Are we paying our fair share yet? The federal government currently taxes interest income at rates ranging between 10% and 35%, yet those rates are scheduled to increase to between 15% and 39.6% in 2013. Barack Obama’s solution is to do nothing for anyone making less than $250,000, and to raise rates to 36% and 39.6% on those making more. Mitt Romney’s solution is to eliminate the tax on interest for taxpayers with incomes below $200,000, while lowering ordinary income tax rates to between 8% and 28%. But Romney shouldn’t even have to play the class warfare game. Either taxing interest is fair, or it’s not. And if it’s not fair, then it’s not fair for any American. If the U.S. government is serious about encouraging savings within its borders, then at the very least it will eliminate the tax on interest. It’s that simple. In no case should any investor earning less than the rate of inflation be insulted with an income tax bill. And to be truly fair, a capital loss deduction should be allowed when a long-term saver loses purchasing power by getting trapped at rates below the rate of inflation. In 2003, President George W. Bush proposed to eliminate the U.S. dividend tax stating that “double taxation is bad for our economy and falls especially hard on retired people.” He also argued that while “it’s fair to tax a company’s profits; it’s not fair to double-tax by taxing the shareholder on the same profits.” Perhaps he was right. In Brazil, dividends are tax free, since the issuer company has already paid a tax. In Japan, since 2009, capital losses may be used to offset dividend income. But in the U.S. dividend income is first taxed to corporations at rates ranging from 15% to 35%, before being paid to shareholders. Investors then get hit with a second tax on the same income ranging from 10% to 35% on ordinary dividends, or limited to 15% on qualified dividends (on stock held for greater than 60 days). And income tax rates on dividends are scheduled to increase to between 15% and 39.6% in 2013, on both ordinary as well as qualified dividends. Naturally, Barack Obama’s solution is to raise taxes on dividends. Obama plans to keep Bush’s lower 10% tax bracket in place, but to raise top tax rates to 36% and 39.6% on those most likely to invest in dividend paying ventures, those making more than $250,000. Mitt Romney, on the other hand, would eliminate the tax on dividends for taxpayers with incomes below $200.000, while lowering ordinary income tax rates to between 8% and 28%. I believe that Romney is on the right track; however, if double taxation is unfair, then it’s just not fair – no matter how much income is involved. Dividends should either be taxable to the corporation or the individual, but not both. And lest we forget, a tax on dividends may also be punitive, in the sense that when an investor’s returns are lower than the rate of inflation, purchasing power is being lost, not gained. If the government insists on taxing both entities, then the tax should only apply to individuals on the amount of return in excess of the rate of inflation. No American should have to pay a tax on capital gains or interest income, unless the return on investment exceeds the rate of inflation. No American should have to pay a tax on dividends when the tax has already been paid by a corporation. Whether it’s easier to just do away with investment taxes altogether is subjective, but I do believe that it’s in best interests of the United States to entirely eliminate them for every American. No American should ever be taxed after suffering a decline in the purchasing power of their capital. At the very least, the basis of capital investments should be adjusted for inflation, and capital losses should be deductible in full and concurrently. If the return on investment is less than the rate of inflation, then there is nothing to tax. Barack Obama has proposed to do nothing for 98% of taxpayers, and to raise taxes on the investment income of those making more than $250,000. He’s so stuck on the class warfare tack that he has totally forgotten to put anything on the table which would encourage greater levels of savings and investment within the United States. If Obama is somehow successful, I would expect more capital and more jobs to be shipped overseas. Mitt Romney has proposed policies which will encourage greater savings and investment. Although his plan isn’t perfect, it’s far better than the alternative. Romney would eliminate the tax on capital gains, interest and dividends for taxpayers making less than $200,000. He would also lower the bottom tax rate to 8% from 10%, and top rates to 28% from 35%. Romney’s policies are more likely to retain capital within the U.S. and to attract more from abroad, which will lead to increases in gross private domestic investment, GDP, economic activity, employment and wealth creation.